Eisamoy Sharadiya 2016 (1423) Bangla Magazine ebook pdf file. 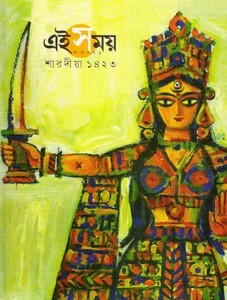 Eisamoy Sharadiya is an wonderful Literature relating magazine for Bengali language people. It is publish from Kolkata and Suman Chattopadhyay is editor of the magazine. This special Durga puja edition's cover stories are scarce : the story of an wonder manuscript of Tagore songs, special composition- chhabi o gaan, poems by Shankha Ghosh, Joy Goswami, Sumanta Mukhapadhyay, Abhik Majumder and many more poets. Graphics story, micro novel, natok, novel- Ratilekh by Debesh Roy, stories etc. Collect the Bangla magazine as pdf file.